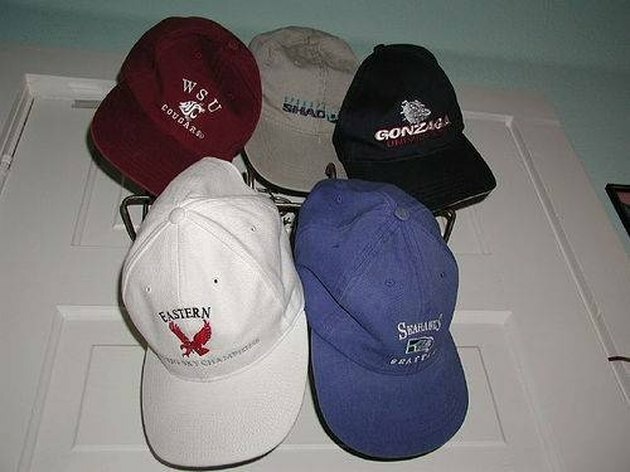 There are people who have a favorite ball cap that they like to wear all the time. However, wearing a cap for any length of time can cause it to get dirty with sweat stains. These stains can be hard to get out, but there are ways to have a clean cap once again, simply and quickly. All you need are some household items you've probably already got and a little elbow grease. Wet a clean cloth with water. The cloth needs to be wet enough to wet the cap but not soaking wet. Dab the cap with a wet cloth to moisten the areas that are dirty with sweat stains. Add a small amount of the shampoo to the dampened areas. It doesn't matter which brand of shampoo you use. Use an old toothbrush to scrub at the sweat stains. Soak the stains for 20 minutes to try to break up the dirt. Rinse the shampoo off the cap with clean water. Wash the cap in your washing machine. Put it on a coffee can or a pot close to the same size as the cap to dry so it keeps its shape. Put ½ cup of baking powder in a bowl. Add enough water to the baking powder to form a paste. Apply the baking powder paste to the sweat stain areas. Pour the vinegar on the paste. Scrub the vinegar and paste into the stained area. Rinse the paste off with running water. Wash the ball cap in the washing machine. Throw the toothbrush away or put up where it won't get used for teeth by mistake.